Use a Singular Themer layout to design Themer layouts for single-event pages for The Events Calendar. For an introduction to how Themer layouts work with The Events Calendar plugin, see the overview article. Here's how to create and design a Themer layout for a single-event page. Tip: It helps to have some events created first so that you have something to preview as you design the layout in Beaver Themer. For Location, click Choose, then from the Events section choose Event. By default, the location will apply to every single event page, but you can include or exclude specific items by setting up inclusion or exclusion rules. In the Preview as field at the top of the page, select Event, then select a particular event page, assuming you've created one already. The Themer layout opens with the singular template for standard posts. To use the Event template to start building your page, click Templates in the upper right corner and make sure General is selected. Select the Event template, then click Replace existing layout. 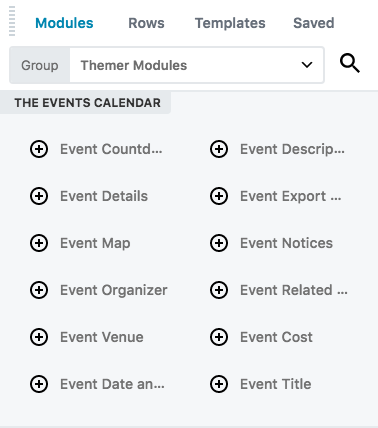 These modules can be used to display the event description and the many custom event fields that you may have filled in when you created the event. If you added the Event template to your page, you will see many of these modules.